They should also only be done with local council approval and permission. But as these 2 residents found out, the price to pay is heavy when you act without proper approvals. The article talks about how residents have been fined for unlawful tree removals and tree lopping. The end result for the resident? $83,000 in fines! All because appropriate approvals were not sought from council prior to tree removal. Resident should have checked with council about the situation and sought guidance. Since trees are not on her property, she can’t legally remove them. The contractor should have done their due diligence to make sure that approval from council has been received by the resident OR they should have sought approval themselves but they should also check the location of the trees. In the second case, the resident was fined $75,000 (ouch!) for the illegal lopping of 13 trees on his property. But here’s the interesting situation. The resident was misled by the contractor who wrongfully said the trees were considered ‘weeds’ and therefore council approval was not needed. Always make sure you get your information straight from council. It always pays for residents to learn more about their areas and what trees are best suited to their properties. So if you ever get approached about tree lopping or removal by a contractor off the street, you can call them out! In this situation, the contractor clearly acted unethically and took advantage of the residents lack of knowledge. This is simply greedy and as the article states, has caused tremendous harm to the local vegetation. The best advice we can give to you is to know your property. Make sure you understand your property boundaries (in cases where its not always clear) and learn your rights about what you can and can’t do when it comes to tree maintenance, in particular those that are close to property borders (either side). Also, a good reliable professional tree contractor isn’t going to rock up from the street and randomly ask you to knock down trees. That’s the work of fly by night charlatans who only want to line their pockets and hurt our industry. At North Brisbane Trees, we will never ever mislead you on what should be done. Customers always have their reasons for calling us out: whether it be to inspect the condition of trees or to prune them or remove them altogether. Whatever it is, we make sure we inspect everything completely so you know what your legal options are. We’ll also never go against local council regulations. This is illegal and not the way we do business. Our MD Craig Bauer is Level 5 Cert Qualified Arborist and is legally allowed to produce Arborist Reports. Not many companies have this level of authority and certainly not this level of experience and knowledge. Don’t risk it. Trust only the best in the business. 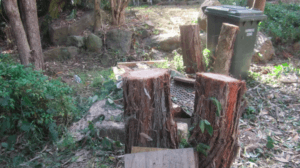 Talk to North Brisbane Trees and avoid paying hefty fines for unlawful tree removals!